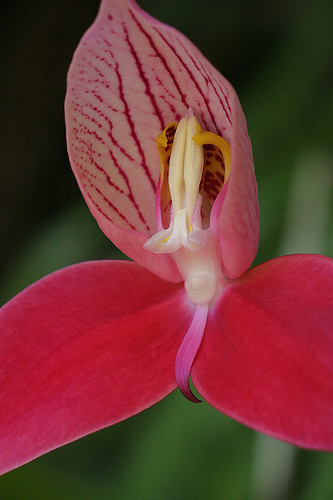 Disas require rather different conditions than many other orchids. But meet their needs and they grow fast! Forget everything you know about growing other orchids if you want to keep these: in particular, they are NOT epiphytes! Also, the conventional wisdom that most orchids die from overwatering does not apply. One could reasonably consider Disas to be water plants, as they are sometimes found completely submerged in nature during certain seasons, and they generally grow right next to streams. You should water them at least daily, set them in buckets of water, or even construct flow tables that keep water flowing past their roots constantly. They should never, ever dry out or they will die. Since these plants get so much water, you may sometimes need to treat bacterial and fungal diseases. But whatever chemicals you use need to be at low concentrations, because the plants require pure water! Disas don't like root temperatures above 70°F (21C). Otherwise, they are pretty forgiving about temperatures: they can withstand (very) light frost and temperatures over 100°F (37C), on occasion! Higher humidity should help them withstand high temperatures. Ideally, they should have cool temperatures, below 70°F (21C) by day, and 10-15°F (6-8C) cooler by night. Cool root temperatures are especially important. They like bright light; direct sunlight is okay, if you can provide it without overheating the roots. They seem to care a lot about air circulation, so use some fans! After blooming, the plant will die back, but hopefully you'll already see a number of new shoots growing out of the pot. You should pot these up separately, as the old plant will rot! Also repot them any time they don't appear to be doing well, as it gives you a chance to cut off any rotting roots.